The ‘E’ in E-Crane stands for equilibrium, the principle upon which the cranes’ innovative technology is based. However, it is so much more than just that. E-Crane® Worldwide is the original balanced crane designer and manufacturer. The company, based in Belgium, with subsidiary companies in The Netherlands and in the USA, has been providing reliable solutions for the past 20 years to the recycling and bulk handling industries. With a global network of agents, it offers local support from certified E-Crane service engineers. E-Crane offers tailor-made solutions to meet its clients’ needs for high productivity and reliable handling of scrap, grain, coal, cement clinker, or any other bulk material, while striving to optimize operations, increase efficiency, and lower costs. Balance is one of the key factors for any crane in the industry. Without the right balance, a crane will lose its stability. To avoid this, all cranes know the principle of the ‘counterweight’. In most cases, this counterweight is at a fixed point on the crane. On an E-Crane, however, the counterweight is linked to the stick, so it can automatically compensate for the lifted load. The balance crane provides a fail-safe system which guarantees that the crane will always be in balance. The link between the stick and counterweight creates a four-bar mechanism, which ensures that the counterweight continuously balances the total weight of the steel structure along with half of the operational load. As the lifting radius is varied, the change in the load moment is automatically equalized by the moving counterweight. Lower energy consumption means lower costs. With traditional hoisting machinery, the payload, working tool, and steel construction have to be raised, but the E-Crane’s balance compensates for all but the payload. It goes without saying that this results in important energy savings. To be balanced at any given position, the counterweight has to continuously compensate for the load. As the load increases, the counterweight must also increase in weight. Alternatively, instead of increasing the counterweight, it could be moved further rearward from the centre of rotation to compensate for the increase in the load. For example, a one-tonne load at a 20ft radius gives a forward load moment of 20. This load moment would then be equalized or counterbalanced by a 4-tonne counterweight at a distance of five feet, having rearward load moment of twenty (20 × 1 = 4 × 5). In close co-operation with clients, E-Crane’s engineers understand the project goals and lend suggestions from extensive past experiences. Utilizing state-of-the-art 3D software, animated ‘real-time’ examples of a working machine at the customer’s facility can be produced. This can be done from multiple viewpoints, simulating views in the ship or barge. For optimum productivity with the E-Crane, a wide variety of attachments are available, tailored to the specific job requirements. The E-Crane product line offers exceptional all-round flexibility and versatility. Using a ‘Series Built’ family of standard components adds value to its client partners. Lowers are available in fixed or freestanding pedestals, rail, crawler and rubber tyre models with high or low portal carriers. The upper is built around a wide range of boom and stick combinations, allowing for a tailor-made ‘custom’ material handling solution at off-the-shelf-prices. Ten years ago, E-Crane delivered the first barge- and ship- mounted E-Cranes to offload barges and small ships. E-Crane has adapted this great concept for the offloading of ships up to Panamax-class and has more than 15 units successfully operating worldwide. These barge- or ship-mounted E-Cranes have been developed in close co-operation with the company’s clients. 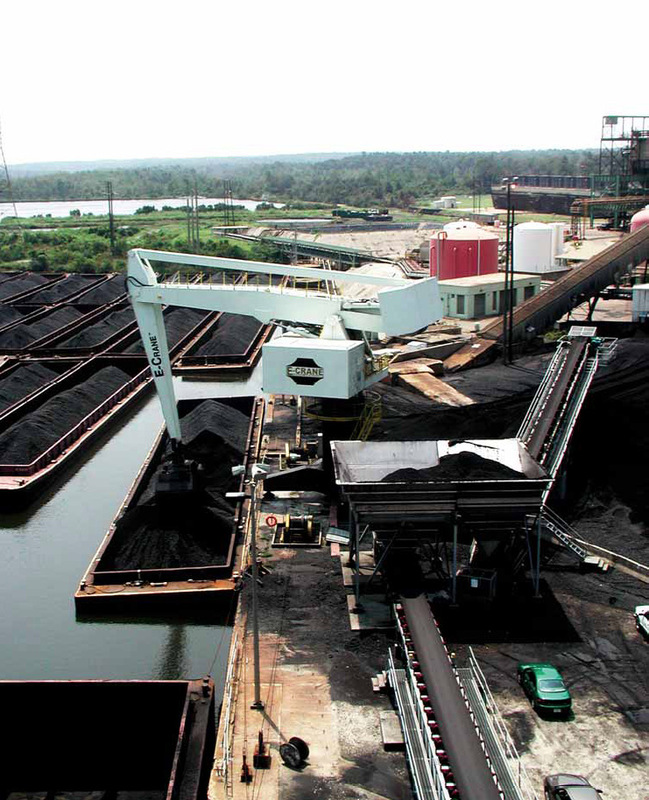 The concept of a floating bulk handling terminal is well suited for both port operations (ship-to-shore) as well as midstream transfer (barge- to-ship and ship-to-barge). The E-Crane organization is always open minded when it comes to solving clients’ special needs and requirements. This renowned ‘can-do’ attitude has resulted in cutting-edge solutions that have successfully served E-Crane’s customers world-wide. The development of the E-Crane® Floating Bulk Terminal is another logical step in the evolution of this unique material handling concept. hoppers (can be attached to the E-Crane); barges; and barge haul systems. the option to have a floating buffer storage to smooth out any peaks and valleys between inbound and outbound material deliveries. These advantages combined with the state-of-the-art, proven E-Crane technology result in excellent productivity and an extremely versatile; fully integrated solution for today's bulk handling industries.